* Pats offense starting to wear down the Lions D a little bit, they need to step up and make a play here. * Big play again to Branch, this time for a score that gives the Pats a 31-24 lead after a 22-yard score. * Lions still hitting some plays, as Hill continues to keep his eyes downfield. He’s over 200 yards throwing with a TD and a pick. * Offensive pass interference kills a 22-yard pass play that would have given the Lions a big first down. * Wow, now a facemask penalty on third down, though it wouldn’t have been a first down, Jeff Backus didn’t give them a shot with that penalty. * CBS pointing out the tough day Smith has had in the secondary, that’s an understatement. * A little trickery on third down converts for the Pats, as a direct snap to Danny Woodhead pays off with a first down. Lions offside on the next play, they are making too many mistakes to win this game right now. * That was a killer drive, there’s a reason this team is 2-8, and that drive was a big reason. * Another pick, as McCourty makes his second of the day to put the nail in the Lions coffin. * Seven straight Thanksgiving Day losses for Lions. Subscribe to Lions Gab via RSS Feed or E-mail and receive daily news updates from us! 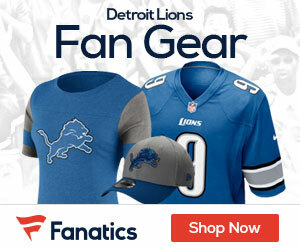 Sign up to receive our daily Lions Gab newsletter, and keep up to date with all the latest Detroit Lions news. Celebrity Seats has all the best Detroit Lions Tickets, Detroit Tigers Tickets, Detroit Pistons Tickets, and Detroit Red Wings Tickets!